St. John Bosco High School will honor philanthropist attorney Brian Panish tonight at the dedication of a new 5,000 seat stadium in Bellflower, California. Alumnus Panish is the lead donor of the $7.2 million Panish Family Stadium which was funded by donations from numerous other alumni and community members and replaced the high school’s previous stadium built in the 1960s. The dedication ceremony will be livestreamed beginning at 6:00 p.m. Tuesday evening and will include several speakers and a blessing. Watch the dedication ceremony live here. “I’m hoping this is going to inspire others to give back and help the school, but in other areas, like academic facilities and things like that, to get a well-rounded Catholic education,” Mr. Panish told the Press-Telegram in a recent interview. Mr. Panish lived on campus and played football while attending St. John Bosco High School in the 70s and attributes his current success as a plaintiffs’ personal injury lawyer to what he learned at the all-male Catholic high school. 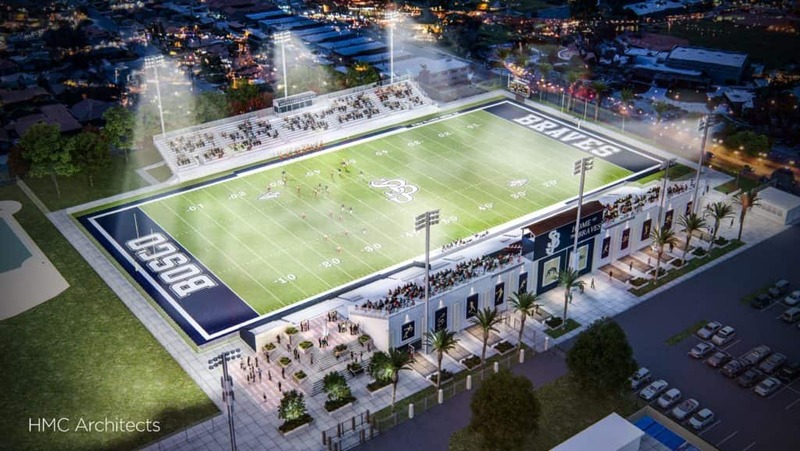 The Panish Family Stadium will host St. John Bosco’s season opener against Timpview High School on August 17, nearly 10 months after breaking ground on the new facility. For a complete schedule of 2018 games, or to purchase season tickets, click here. Read the Press-Telegram story here.